Taking a break once in a while is helpful to help you sail through life, and travel is a perfect idea for the same. 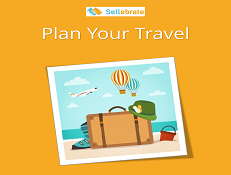 Sellebrate brings you travel gift cards- physical gift cards as well as e- gift cards at a discounted price to get your tickets booked economically. We have listed below 5 reasons for why should one travel and inculcate wanderlust in oneself. Have a look at them. 1. Travel reduces stress and gives you a break We travel not to escape life, but for life not to escape us! It saves you from everyday work and the stress it brings. It lets you concentrate entirely on you, your feelings and emotions, your wants and on things that bring happiness to you and being happy is a great thing, isn’t it? 2. It makes you more open minded Travelling involves visiting new unknown lands with different cultures altogether. This gives you perspective as well as makes you more tolerant to other people’s lifestyle and beliefs. It endows you with knowledge and helps you embrace the greatness of architecture and history attached with places. 3. It gives you the Adrenaline rush Activities such as hiking, scuba diving, rock climbing, rappelling and a hoard of other ones are sure to give you the amazing thrill if you are an adventurous person. 4. You make memories and have unique experiences while travelling You carry back a lot of memories home whether you travel solo or with your loved ones. You get to experience absolutely new things such as learning words from a local language, savouring local food, clicking awesome photographs, making friends from other places and so on. The list is endless. 5. It helps in strengthening the bond with your loved ones Travelling is the ultimate ice breaker between new friends and couples. It helps them get into each other’s comfort zones and know the other one better. It is extremely important for couples to travel together before tying the knot so that crucial revelations happen beforehand only. On the other hand, with your family and friends, trips deepen the existing bond manifolds. Travel ideas have already started popping up in my mind. What are you waiting for? Shop top brands stuff for yourself by https://www.sellebrate.in/buy-gift-cards/60, Book tickets by https://www.sellebrate.in/buy-gift-cards/61, Pack your bags and depart! !